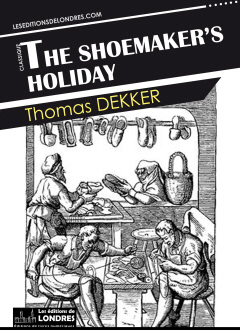 “The Shoemakers' Holiday, or the Gentle craft” is a play written by Thomas Dekker and first performed in 1599 by the Admiral's men. “The shoemakers' holiday” is often categorized as a city comedy. An aristocrat, Rowland Lacy, is in love with a girl, Rose Oatley. Rose's father and Lacy's uncle disapprove of the marriage because of the class difference and Lacy's extravagant spending style. In order to make good, Lacy is told to join the army and fight in France. He does not want to go and convinces someone to go in his place whilst he disguises himself as a Dutch shoemaker, Hans. He becomes the apprentice of Simon Eyre, whilst an actual shoemaker goes to war, to his wife's dismay. In the meantime, a gentleman called Hammon attempts to seduce the true shoemaker's wife, Jane. In order to persuade her, he presents her with a document stating the shoemaker, Ralph, is dead. Yet the shoemaker comes back from the war having lost a leg, and is heartbroken when he finds out that Jane has married another man in his absence. Still, when Jane finds out he is not dead, she goes back to him. Meanwhile, Simon Eyre becomes Sheriff and Mayor of London. The King comes to visit him, and quickly becomes fond of him. At the end, thanks to the King, Rose and Rowland finally marry and Rose is made a lady in order to match their social classes. “The shoemaker's holiday” is set during yet another war with France; the Dutch (and especially their accent) are mocked 400 years before Van Gaal and Austin Powers but not reviled like the French; the play contains the famous poem “The merry month of May”.